La Hora de Cafe | Los Tabicones….Ahora en Chiapas! Coffee time. Its a part of the day for so many worldwide. The days that my work keeps me in the office at INESIN are usually punctuated with the toll of a bell at 11:30 am and the rich smell of cafe, this word which in my mind seems to exude a better flavor than the word coffee. Our routine at INESIN consists of approximately 30 minutes (sometimes longer!) 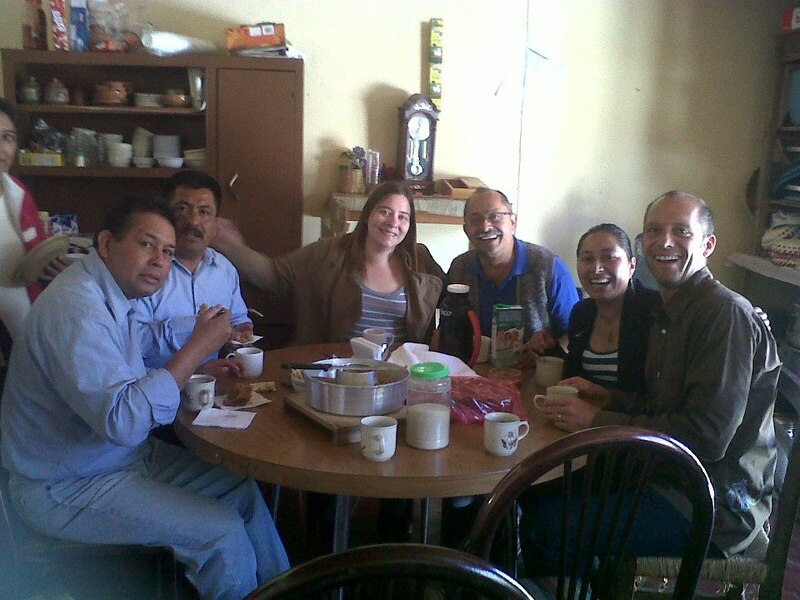 together at the kitchen table (where melas are cooked when guests or workshops are happening), enjoying cafe, pan (bread), galletas (cookies), and fruta (yes, fruit). BUT, what makes la hora de cafe so wonderful for me, personally speaking, is the cultural learning. In my first year it was my primary teaching tool at INESIN to begin to understand Mexican culture, the context in Chiapas, and local customs of working in a small non-profit organization. And it served as a language tool, as the conversation would at times wind its way through theological issues and current events and at other times bounce and zip from one joke to another anecdote, thus expanding my vocabulary. I think all folks in Chiapas know that the cafe produced here in-state is the best in the world (as is defended in all the world’s regions where cafe is produced!). 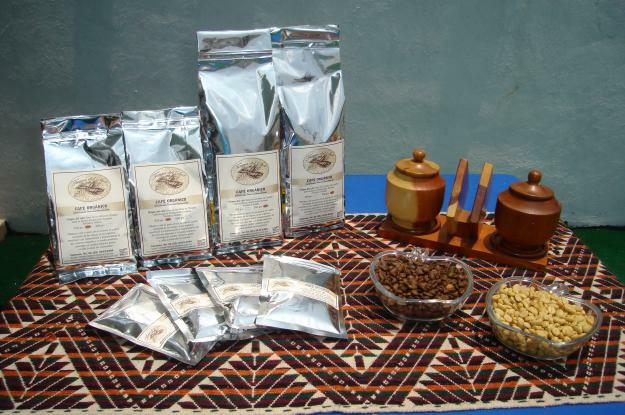 At INESIN we would not dream of purchasing cafe from a cooperative that is not Chiapanecan, as a gesture of support for local producers. 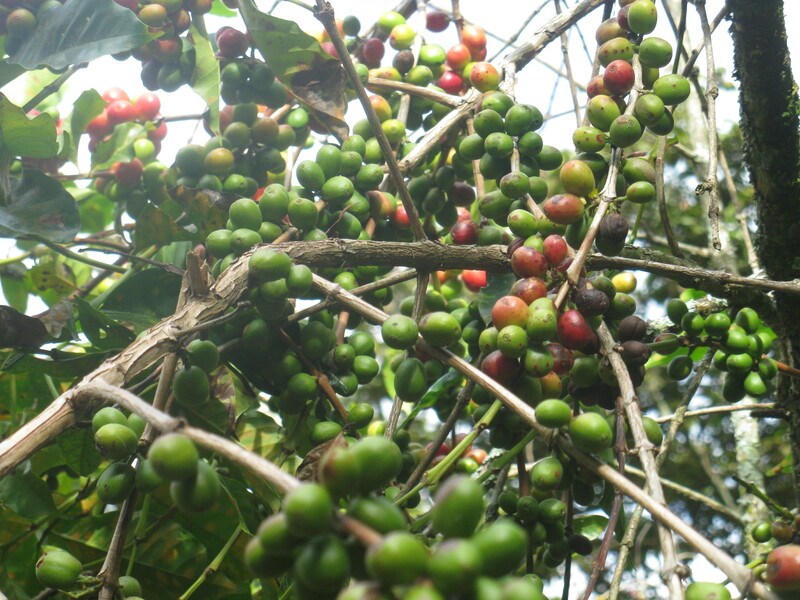 And while we are very much aware of the global dynamics that exist within the cafe economy, I wonder how many of us at INESIN, until recently, could not sleep at night due to the worries of what local producers are now facing……..
Its called “La Roya” in Spanish. It is a coffee rust (or fungus) that over decades has migrated to the Americas from Africa, via Brazil, Colombia, Costa Rica, and so on. 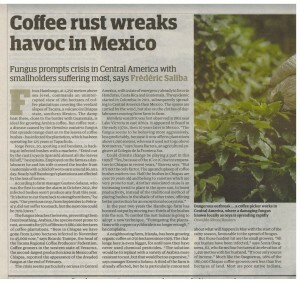 And it is devastating coffee plantations in South and Central America and Mexico like never before. 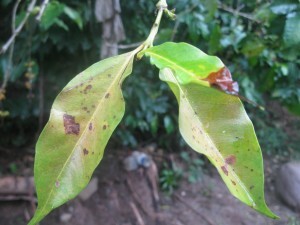 The link below is a CBC story on the current spread and impact of this fungus. 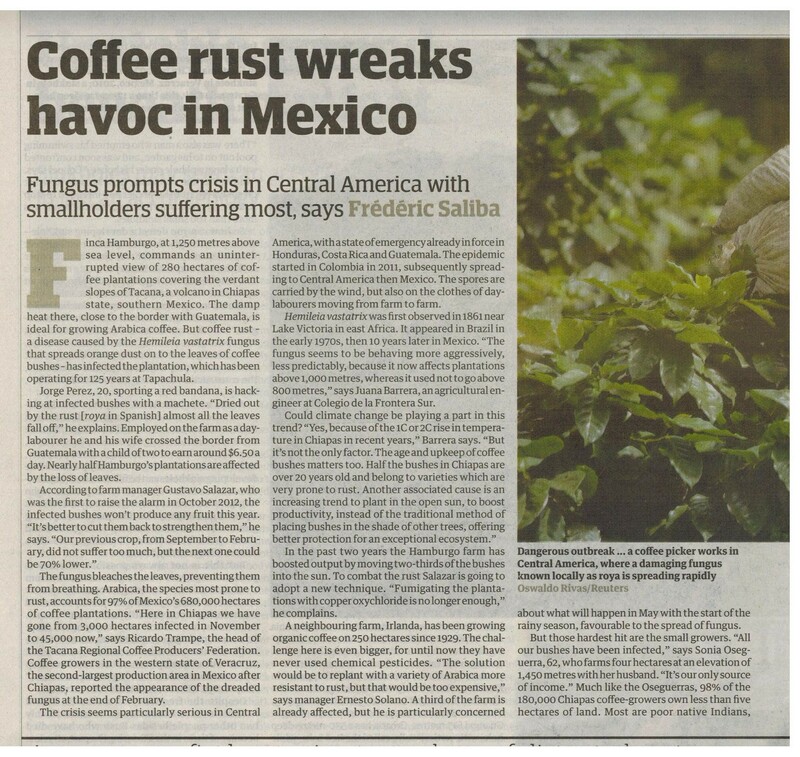 Miriam Harder, a fellow MCC colleague in Chiapas, also sent me a photo of an article in a UK newspaper. Articles like these can be helpful for those who live outside of coffee-producing regions, at the least as a means to indicate a possible rise in the price of coffee. Better, however, articles may also provide the opportunity for the reader to gain a glimpse into the life of a producer, who is affected so much more than simply another 25 cents a cup…..
INESIN’s work with community groups includes a region where coffee production is the primary source of income to the family economy. I have the pleasure of travelling to this area every 2 months to support the group, provide workshops, and visit individual families for encouragement and assessment. 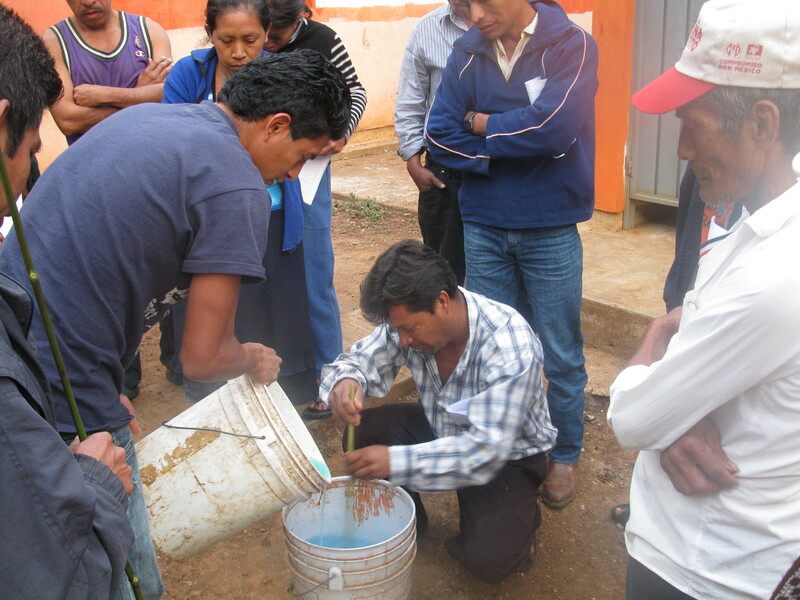 Our work is mostly focused on home-based gardens and improving family diets, but last November the call came from the group…”would INESIN be willing to help us with our coffee situation?” The three communities in this region where we work receive virtually no technical agronomic support by government, so the groups felt very vulnerable in having few-to-no tools in addressing the situation. Great yields this past year in the municipality of Buena Vista, but with the presence of roya, significantly fewer cherries will be harvested next year. Via a friendship and some organizational ties, we were able to work with a local ag technician to provide the groups with some technical workshops on Integrated Coffee Management, and specifically, Organic Treatments to Coffee Rust (roya). This occurred in January, when it still appeared possible to combat the rust as it was advancing. In March it looked worse, but the producers were still waiting to see if the treatments would have an affect. 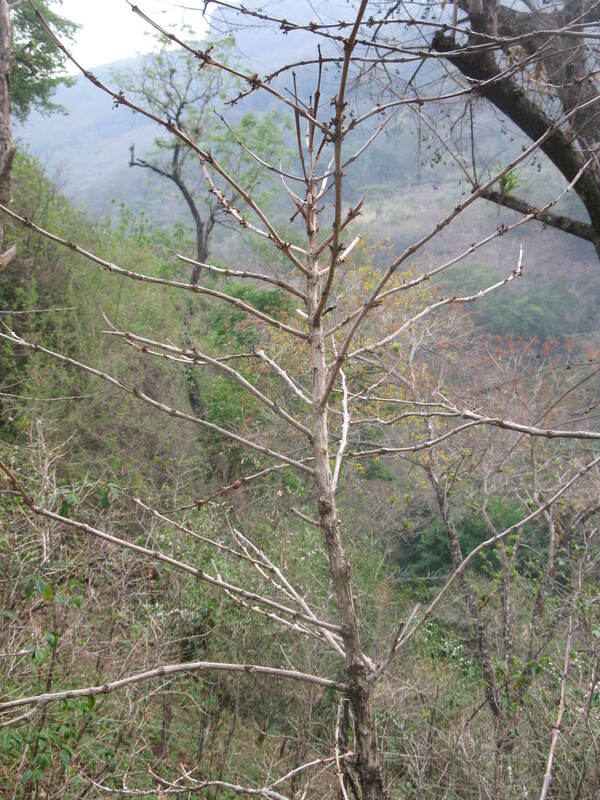 Last week when I was there, there was a general admission that a lot of work and very little profit is on the horizon for the next several years, as plantations must be renewed. This can sound similar to many stories we hear in Canada/USA/EU where producers lose their harvests due to natural, unavoidable causes….YET a critical difference is that for most every small producer in Latin America (and there are millions in this category) there are no safety nets, no crop insurance, and as it became very real for me this past week, no other opportunities close to home (several people have already left for cities within Mexico in search of work). So it really is La Hora de Cafe. I will still cherish my cafe, perhaps even more in the coming months/years. My consumer choice has a very direct impact on who is being supported, and what management practices are being applied. The cafe we savour at INESIN now seems to have more face, more voice, and more touch. I pray and trust that God’s creation has been instilled with a resilience that will overcome this loss, that the hillslopes will again reflect the sheen of coffee’s green, and that coffee-producing families will make it through, via hope, resolve, and our solidarity. I’m so glad I visited your blog this morning. Although I don’t drink coffee, I can appreciate the very real crisis your people, and all producers of coffee face with the rust. Thanks for being there to help, encourage, and simply be with the people. thanks for your reply and comments. Look forward to re-connecting with you guys in 2014! !